At first, proceeding from the problems of our own age, it seemed clear as daylight to me that the gradual widening of the present merely temporary and social difference between the Capitalist and the Labourer, was the key to the whole position. No doubt it will seem grotesque enough to you—and wildly incredible!—and yet even now there are existing circumstances to point that way…. the exclusive tendency of richer people—due, no doubt, to the increasing refinement of their education, and the widening gulf between them and the rude violence of the poor—is already leading to the closing, in their interest, of considerable portions of the surface of the land. About London, for instance, perhaps half the prettier country is shut in against intrusion. And this same widening gulf—which is due to the length and expense of the higher educational process and the increased facilities for and temptations towards refined habits on the part of the rich—will make that exchange between class and class, that promotion by intermarriage which at present retards the splitting of our species along lines of social stratification, less and less frequent. So, in the end, above ground you must have the Haves, pursuing pleasure and comfort and beauty, and below ground the Have-nots, the Workers getting continually adapted to the conditions of their labour. However, neither the Eloi nor the Morlocks are fully human. The Eloi have grown lazy and dull, while the Morlocks have somehow regained the upper hand in the war between the two species, and have taken to cannibalizing the Eloi that they feed and clothe. Our argument is that the human species is farther along this path than is commonly recognized. This website, ‘Postflaviana’, is an extended exploration of the consequences of this viewpoint. In order to explain our concept of the elite in relation to racial concepts, it is necessary to begin with some biological theory. In today’s biology, a “species” is defined as a population made up of individuals that can successfully interbreed and produce fertile offspring. Thus, all human beings are considered part of the same species: we can choose a mate from among other humans anywhere on the planet, without significantly impacting our chances of reproductive success. If a species is separated into two or more groups which are not allowed to interbreed, they will start to drift apart genetically. If they are subject to different selection pressures, then the process of genetic divergence is accentuated and directed. Thus, the separated populations may start to become anatomically and functionally distinctive as well. Yet this can go on for quite some time, before interbreeding becomes impossible in principle, because of a failure of the reproductive process in cross-breeding. As long as interbreeding remains a possibility, the populations are considered to belong to the same species — in this case they are called “sub-species”. A good example of “sub-species” are the various breeds of purebred dogs. These populations are separated by their human breeders, so that there is little if any genetic exchange between the breeds. If dogs from different breeds do mate together, the result is called a “mongrel” and is excluded from the entire category of purebred dogs. Although of course mongrels are still members of the species of dogs, they are not considered a part of either of the “sub-species” of their parents. The terms “race” and “ethnic group” are similar in their connotations. “Ethnic group” tends to be more associated with groupings based on culture, religion or nationality, while “race” has a more genetic and physical connotation, but in practice the terms overlap for reasons which I will explain. Humans tend to fall into groups which are separated by factors such as distance, geographical barriers, language, and culture, such that they are much more likely to choose mates from within their race or ethnic group, rather than outside it. However, the barriers to inter-racial or cross-cultural interbreeding are far from insurmountable, so there can be significant gene flow between the various races and/or ethnic groups. However, this does not mean that “race” is a meaningless concept. If we define an ethnicity in terms of a group of people with a shared geographic region, shared language, shared religion, and / or shared culture, then we will find that those people breed within their group far more often than they breed outside of it, and also that the genes of pairs of individuals drawn from within that group will be more similar to each other on average, than the genes of individuals drawn at random from anywhere on the planet. Similarly, the members of an ethnic group may share physical characteristics on the average, and in contrast to other ethnic groups. This genetic similarity results in the concept of “race”. However, there are a great many distinguishable ethnic groups on Earth, and the processes of history tend to alternately raise and lower the barriers between these groups. Thus, those which are “neighbors” (either geographically or in some other shared history) tend to be relatively similar to each other; while those drawn from far-distant regions are more distinctive. This causes the “fuzzy” nature of racial genetics. When we compare, say, an ethnic group from Africa, against another from Northern Europe, the differences are quite distinctive, and we feel comfortable with the conclusion that the groups are from different races; when it comes to Scotsmen and Irishmen, the genetic boundary is far less clear. A modern concept of race and ethnicity is shown in this graph from “Out of Africa Again and Again” by Alan Templeton (Nature 416, 45–51, 2002). 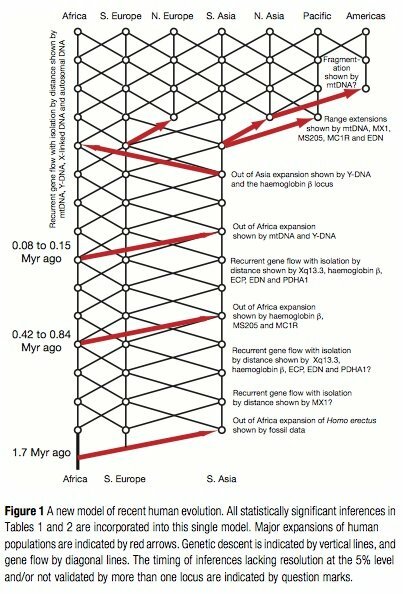 This model reflects the view that ancient human populations such as the Neanderthals of Europe (and others) did not truly go extinct, but rather they contributed some gene flow to the most dominant strain which came late out of Africa; and that these various population groups have been vigorously interbreeding and exchanging DNA ever since. At the most basic level, we argue that throughout history, the class of oligarchs (that is, the wealthy & powerful) are far more likely to have chosen their mates from among other wealthy & powerful people, rather than from the lower classes. Conversely, because of international politics, opportunities for travel, and cosmopolitan values, the wealthy and powerful are far more likely to choose their mates (or have mates chosen for them by their elders) among individuals from far distant locations, different religions, different cultures, or different languages, compared to low-class people with far more limited options. However, all of these mates chosen from all these different locations, regions and cultures will have one thing in common: that they would be wealthy and powerful. Thus, over time, the oligarchs (almost by definition) must have become a distinct ethnicity or breeding pool, which is now increasingly diverging from the rest of humanity. By the same token, the members of this wealthy and powerful ethnic group are becoming increasingly more genetically similar to each other, than they are related to any of the peoples that they rule over. It is also highly likely that the oligarchs are descended from a small founder group; that is, there was almost certainly a single tribe, or a small number of tribes, that were extraordinarily successful in conquering the various nations of the ancient Near East (Eurasia and North Africa), and thus inserting their members into powerful positions, ruling over the members of many less fortunate ethnic groups. Michael Hart, in “Understanding Human History”, argues that at the end of the Paleolithic era, the peoples living in arctic climates had evolved a cluster of genetic characteristics including pale skin and greater technological skills required for survival in adverse conditions, while the people living in southern regions (with darker skins) had the misfortune of living in lands that were far more fertile and thus more valuable. Thus, Hart argues, tribes from the North had both the capability and the motivation to achieve military conquest over people of the South. These individuals from northern (perhaps Aryan, Indo-European and / or Uralic) tribes who found themselves ruling over the various nations of Semites, Africans and Asians would have been highly motivated to breed only amongst themselves: not only because of the political advantages, but because they would have been choosing partners from within their own ethnic tribe, as opposed to the foreigners that they were ruling over. Having originated from a distant location, these pale-skinned rulers would have had a very distinct sense of their peculiar racial identity in contrast to their subjects. Thus, we believe that the “class consciousness” of the oligarchs is likely to be of an ethnic (tribal or racial, or even xenophobic) nature, as well as a nepotistic sense of entitlement to wealth and power. Of course, as a class, the oligarchs also have access to a wealth of knowledge and experience regarding the science and art of maintaining control over the masses. And at this point, the oligarchical class has had a large amount of genetic material introduced from local elites all over the world from every racial background, as well as undergoing distinct evolutionary pressures arising from the unique environment of the elite. As it is often said: uneasy is the head that wears the crown. The oligarchs have been under relentless selection pressure for raw survival to reproductive age. It is highly likely, at this point, that the elites do not view themselves as any more akin to ‘Nordic’ or ‘Caucasian’ or ‘Jewish’ commoners, than any other race of hoi polloi. According to our hypothesis, they are a distinct racial entity unto themselves. Apple watch needs to see your blood before it works! Here’s something interesting and creepy beyond belief – the Apple watch needs to see your blood and know it is being worn before it can receive calls and notifications, OR before it can be used to do any online transaction. On the back of the Apple watch there is a light that has to penetrate your skin and see your blood before the watch will accept the fact that it is being worn. This is part of the heart monitor function. At first I thought this had to be a hoax, but the apple blogs confirm it is real. Apple refuses to comment. Because of this, people who have tattoos on their wrist cannot use the apple watch to do much of anything, not even make calls or receive notifications because tattoos block the watch from seeing their blood. They can’t make online purchases or do anything that requires security because the apple watch wants to see your blood to prove it is you wearing it, and if it cannot it will not enable even basic features. I will never buy an apple watch or anything else like it, it is just too creepy for me. Why on earth would any gadget need to see my blood before it will function? I believe Apple knew the watch would have this problem, and specifically designed it to so the yuppie crowd would buy this gadget, later discover it works this way, and then accept future biometric technologies that function a similar way. Not for me, not now, NOT EVER. Cell phones can be hacked and have their transmitters be modulated in a way that interferes with your heart and can trigger a heart attack. This has been discussed in detail on this web site before. Let me explain a little for people who have not seen this here before – Via AM hetrodyning of your cell phone’s transmitter, it is possible to cause a voltage to be generated in your body, to a depth of a little more than 10 centimeters. If a cell phone is close enough to your body, this voltage can be used to trigger a heart attack. This is not science fiction, it is cold hard reality. NOT FOR ME, NOT EVER! The recent outbreaks of whooping cough in the United States may be due, in part, to a change made two decades ago to vaccine ingredients, a new study finds. In 2012, the United States had about 48,000 cases of whooping cough (also called pertussis) — the most cases since 1955. Although the numbers dropped in 2013 and 2014 to about 29,000 cases yearly, there are still far more cases now than in decades past. Between 1965 and 2002, there were no more than 10,000 cases yearly. Researchers have proposed a number of ideas for the increase, including increased awareness of the disease and better diagnostic techniques. Others have suggested that fewer people were getting the vaccine, and some thought that the new vaccine’s ingredients were less effective. They found that a change in vaccine ingredients was the best explanation for the recent whooping cough outbreaks, according to the study, published today (April 23) in the journal PLOS ONE Computational Biology. Whooping cough is caused by the bacterium Bordetella pertussis, which infects the respiratory system. The disease causes people to make a distinctive “whoop,” or gasp, when they inhale after a coughing fit. Doctors began vaccinating people against pertussis in the 1940s with a type of vaccine called a whole-cell vaccine, which was made of dead bacteria. This type of vaccine “can raise an immune response, but cannot cause the disease,” said the study’s lead researcher, Manoj Gambhir, an associate professor of epidemiology at Monash University in Melbourne, Australia. Widespread use of this vaccine dramatically cut pertussis infections. Before the 1940s, there were 150 cases of pertussis yearly for every 100,000 people in the United States, but during the 1970s, that number had dropped to an average of 0.5 cases yearly. But the whole-cell vaccine sometimes caused side effects, such as fevers, and in some severe cases, people developed fever-induced convulsions, Gambhir said. In 1991, researchers developed a new, “acellular” vaccine that does not contain dead bacterial cells. This vaccine “contains far fewer components of the bacteria and, therefore, far fewer possible biochemical triggers for the adverse events,” Gambhir told Live Science. Doctors began using the acellular vaccine in the U.S. during the 1990s, but it turned out to be less effective than the original vaccine: It prevents 80 percent of cases, compared with the 90 percent of cases that the whole-cell vaccine prevented, Gambhir said. This means that, of the people exposed to the disease, about 20 percent who received the acellular vaccine may still get sick, compared with just 10 percent of those who received the whole-cell vaccine. Babies under age 1 have the highest number of pertussis cases. (Infants younger than 2 months old cannot receive the vaccine.) Young children are especially susceptible to the bacterial infection: In 2008, 195,000 children died from pertussis worldwide. Normally, in a pertussis outbreak, a first wave of cases in infants is followed by a second “bump” of cases in adolescents. (It is thought that immunity to pertussis wanes in the teen years, so doctors recommend getting a booster shot.) But in a 2010 outbreak, researchers noticed that children ages 7 to 10 were getting whooping cough. In 2012, an outbreak that centered in Washington affected mainly 7- to 13-year-olds. The new study supports the idea that researchers need to develop a pertussis vaccine that is both safe and effective, said Dr. Pritish Tosh, an infectious-diseases physician at the Mayo Clinic and a member of the Mayo Vaccine Research Group, who was not involved with the study. “In the long run, we may need to have newly designed pertussis vaccines that give a broader and longer-lasting protection,” he said. In the meantime, people should continue to get the current vaccine to protect not only themselves, but also infants who haven’t received the vaccine yet and people whose immune systems are compromised, Tosh said. Pregnant women can also receive a booster shot during their third trimester to protect the fetus, he added.